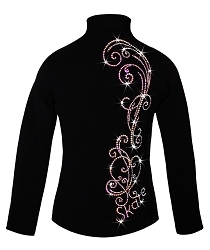 Ice Fire Skate Wear was created and developed by a figure skating coach, professional skater and a Mom of little girl, who just started skating. 25 years of experience draw an unfair conclusion that skaters spend hours, days and months on the ice practicing and only a few minutes performing and celebrating. To add some sparkle to an every day practice routine we can help you design your own unique ice skating outfit or find a perfect gift for an ice skater. Skating is not only a fun activity, but also a fun sport and just like any other sport, there is appropriate gear that one must wear when they are practice. Before you decide to give an ice skating a go, you need to make sure that you have a complete ice skating outfit to use whenever you are out on the ice skating rink. Ice Skating Jackets and Ice Skating Pants are essential items for you when you decide to go ice skating. 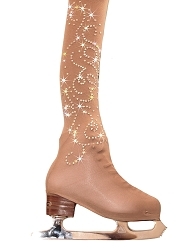 They should be well fitting and comfortable next to skin in order for you to truly enjoy your ice skating experience. At icefireskatewear.com we redefine the meaning of the practice ice skating clothes and trying to make the best ice skating pants and ice skating jackets that you have ever come across at very pocket friendly prices. Each and every sporting activity requires certain specific clothing items and ice skating is no different. At icefireskatewear.com we cannot over emphasize the importance of wearing properly fitting ice skating jacket and pants during practice. When shopping for your ice skating clothes we always encourage that you insure that your skating pants and jacket are tightly fitted but stretchy. 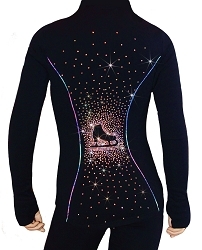 Fitted look of your ice skating outfit is also very important for your ice skating coach, so she or he can clearly see all your body lines to notice and fix any imperfection in your moves or jumps. It is for those reason we test many fabrics and choose Power Stretch fabric by Polartec. Functionality is most important quality for ice skating clothes, but unique look, what make ice skating outfit more desirable and fun to skate in. For this reason collection of unique rhinestone applique with skating theme was created for our ice skating apparel line, to make it stand out from others. Well known Swarovski rhinestones our favorite brand in crystals variety. As rhinestones become most popular decoration on clothes other brands of rhinestone appear. Again, we are try to pick the best quality and price to make it affordable for everybody. As our company grow and base on our costumers feed back , that we always appreciate it, we are keep expanding our rhinestones designs collection, colors of the rhinestones and always open for new ideas. Our Venetta Collection created for more advance skaters and made out of Supplex Microfiber fabric that are thinner, but has a great stretch and shape holding quality. Specially designed ice skating jacket and pant pattern offering noticeable slimming effect. This collection are available in Child/Adults sizes it continue to grow and recently have new release of Venetta Junior and Venetta Fit styles. Our Personalized Ice Skating Jackets and Pants have wide variety of designs and color, just pick your favorite and we can personalized for you. Never loose your jacket at the ice skating rink , have your own one of a kind outfit! Criss Cross Collection featuring heavy weight stretch fleece, as well as or Polyspandex (brushed medium weight fabric) and glowing neon stripes going in criss cross directions. Rainbow criss cross pants and jackets are the latest hit in our criss cross collection . Featuring contrast waistband and cuffs also contrast collar the jacket collar. Enjoy new twist in your skating clothes! Ice Fire try to stay in vogue and stylish giving you a modern look and versatility as you go about your skating activities. Our ice skating clothes come in Child and Adult sizes, please, check our Size Chart for best fit. We also happy exchange the item if you need different size. Don't wait and pick some new ice skating pants from our Ice Skating Apparel Line and glide fashionably on the ice!